The Ethiopian authorities are once again moving to pass another legislation which would completely paralyze the last remaining independent publications circulating in the country. The legislation is expected to come into force in the coming year, ahead of the 2007 national election. The new legislation, which changes the whole existing distribution system of private publications, came following a controversial research report released recently by the government accusing several independent publications of working to incite violence in the country. The research was said to have been intentionally orchestrated to be an excuse for future possible attack. The free press in Ethiopia has been in great trouble since 2005. The new measure is the latest move by the Ethiopian government to completely control the already engulfed newspapers and magazines operating in the county. According to local reports, together with other restrictive laws in force, the new legislation would lead to total absence of independent press outlet in the country. It is believed by many to be a strategy to silence opposition voices ahead of the 2007 election. The new legislation, which are currently at draft stage, are, however, said by the government to be intended only to solve what it called “problems in the distribution of the private press outlets.” The government says the existing distribution system is totally controlled and abused by opposition groups, and needs to be changed. According to the draft law, the distribution of the publications must be done through small business enterprises, which are established under government job creation program. Such enterprises are, however, believed to be established to push government political agenda and interest. According to journalists and political activists, the law allows the government not only to put pressure on publishers to comply with its own interest but also to hijack publications with unwanted messages during circulation. 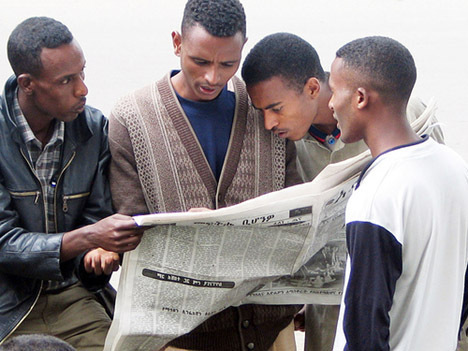 The free press in Ethiopia has been struggling between life and death in the past few years. The situation has, however, dramatically deteriorated after the 2005 election, which saw more than 300 unarmed peaceful protestors killed by government security forces. Since then, the Ethiopian People’s Revolutionary Democratic Front (EPRDF), which once had been promising to insure freedom of the press in the country, has taken several measures against the free press. According to different reports, only in the after math of the 2005 election, more than half of the total numbers of the papers, which had been operating in the country during pre election period, were closed. The Anti terrorism proclamation is the recent legal instruments passed by the regime in Ethiopia aiming to hamper the free press. Adapted in 2009, it has been used to crackdown independent press outlets, journalists, and bloggers deemed by the ruling party to be critical. Currently, there are very few independent publications left in the country operating under the most repressive media environment. In the face of challenges, they are serving as the only source of independent information to the public. These media outlets are also the only platform for public discourse. Mass media is highly controlled in Ethiopia. With 90 million population, the country has only one state owned television broadcast network and some radio broadcast stations, which are totally used as a propaganda machine by the regime.